Sign up for new course alerts & special offers! Students learn to design, install and maintain IT Security systems. It's a well-rounded program that includes essential troubleshooting techniques necessary to repair and secure a wide array of computer networks and electronic devices. This new Diploma course will give a person with no prior computer experience the skills and confidence needed to enter the IT Security field. Cyber Security is one of the fastest growing fields in IT and many organizations employ specialists to help keep their information systems safe. Financial institutions, health care, aviation, utilities are among the many industries that IT Security technicians are employed. The IT Security course assumes no prior computer experience. It expands on CIE's Computer Security Specialist certificate program to include lessons on Network Defense and Countermeasures, Security Techniques and Ethics. It was designed for the distance learning student and gives them the knowledge to master Cyber Security. Learn the fundamentals and terms associated with today's digital world including computers, mobile devices, Internet research, apps, programs and digital security. Students understand the components of a system unit, operating system and utility program. Obtain a strategy to purchase the right computer or mobile device. Extensive coverage of issues such as file sharing, infringement of intellectual property, security risks, Internet crime, identity theft, employee surveillance, privacy and compliance. Students gain an excellent foundation in ethical decision-making needed for future IT professionals. This course was designed to be the gateway into the entire field of computer security. It brings together all the basic concepts, terminology and practical skills essential to security. Topics include virus attacks, hacking, spyware, network defense, firewalls, VPNs, cyber terrorism and industrial espionage. Introduction to the concepts of firewalls and VPNs along with the techniques used to attack hosts and networks. Learn TCP/IP protocol suites and basic firewall requirements. Step-by-step guideleines for installation, designing and implementing a virtual private network are described. See how to analyze log files with network forensics. Cover the concepts related to protecting a network against an attack. A review of network operation is accompanied by theoretical threats to networks and the best possible countermeasures are shown. Administrative policies that keep networks secure are covered as well. Learn all the need-to-know information about staying secure, including maintaining a secure environment and how to avoid security attacks. Topics include Intro to Security, Desktop Security, Internet Security, Personal Security, Wireless Network Security and Enterprise Security. 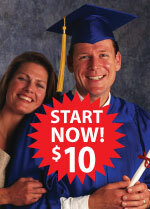 Enroll on-line in Course 7C for only $10 down. Includes educational resources like instructor support, a video library and online exams. Call (800) 243-6446 with any questions or e-mail us. Courses available to residents of the United States, Australia and countries located in North America. Ohio residents will be enrolled under standard tuition rates. How Does Distance Learning Work? 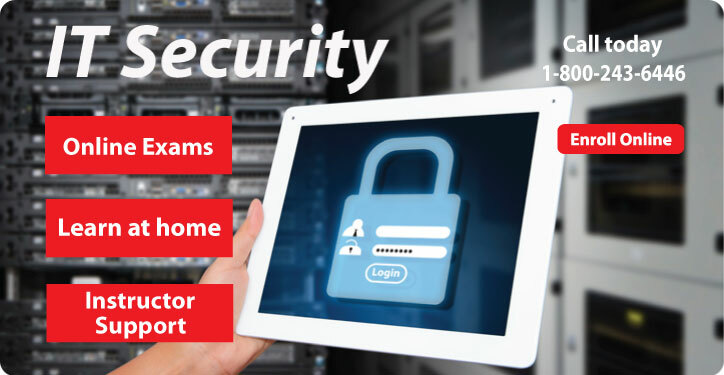 The IT Security curriculum was created specifically for the distance learning student. It was designed to educate students who live at a distance from a college. with you one-on-one to answer your questions and provide you with technical assistance when needed. Questions about course material can be asked via e-mail, chat room, telephone or mail. CIE has an open enrollment policy and you can start this program at any time. One of the advantages of enrolling with CIE is that you can study at your own pace. Some students go through the program slowly, others at an accelerated level. We can accommodate almost any arrangement that suits you best and with our generous time allotment of 12 months for Course 7C you can be assured to have enough time to complete your program. Students graduate with a Diploma in IT Security and will be ready to apply their skills in the IT Security field. Let CIE help you reach your career goals with a professional Diploma that will reward you every day with a powerful feeling of achievement the rest of your life! CIE makes it easy to get your computer training started with absolutely no risk to you while providing you with all the assistance you’ll need to succeed. 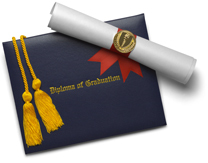 Earn a Diploma from a school that has been teaching via distance learning for 85 years. The course material is sent to your home and you can take your exams from home on our e-grade web site. Contact our instructors anytime you have a question with your course work. They’ll help guide you through your studies one-one-one so you never have to study alone. Study at times that are most convenient for you with our generous time allotment to complete this course (12 months). Approved by the Ohio State Board of Career Colleges and Schools to offer postsecondary programs of electronics technology, computer technology and electronic engineering technology. Registration Certificate 70-11-0002H. Cleveland Institute of Electronics has been an accredited business with the Better Business Bureau since 1964 with an outstanding rating. A Better Business Bureau Accredited Business rating means the Better Business Bureau has determined that the business meets accreditation standards, which include a commitment to make a good faith effort to resolve any consumer complaints. Students are responsible for purchasing a limited number of textbooks for this course that are not included in tuition. Please call an Admissions Advisor at (800) 243-6446 if you have any questions.